Discussion in 'Apple Collectors' started by max¥¥, Dec 28, 2011.
do the plus's have the same problem with leaking caps on the logic board that SE's have? Is it worth replacing the caps even if they aren't leaking? also has anyone encountered a problem where the floppy drive just clicks continuously, or has any idear how to fix it? Nope, no problems like the SE. Whilst any Electrolytic cap can leak, it's those pesky surface mount ones that destroy later machines on a regular basis. also has anyone encountered a problem where the floppy drive just clicks continuously, or has any idea how to fix it? Several possibilities. Do you have a recording of the sound? It probably has, but there were many revisions to the rebuilt analog boards. If the 3.9uF cap on the top edge is a white axial poly cap (like this) then the revision is a fairly late one. Not really. IIRC there's 3 axial electrolytics. It certainly wouldn't hurt, but I don't think it's necessary. Hmmm. Still need to hear the sound to be sure. "Stability" may refer to it's reliability over time. In that case, yes. 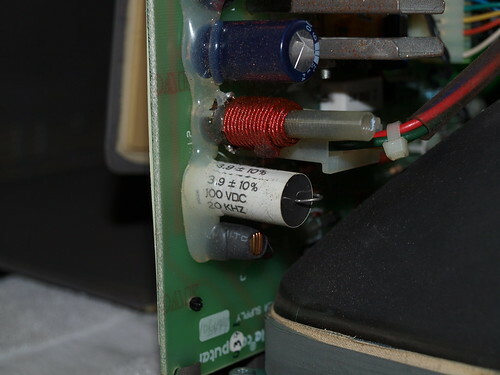 One rectifier on the output of the power supply was swapped from an axial diode to a TO-220 MBR1035 IIRC. You'll see it mounted to the heatsink with a nut & bolt.